Request a quote for a bulk order for TDG monoclonal antibody - Classic. Please fill out the form here below. Your local sales account manager will get in touch with you shortly and send you a quotation based on your requirements. Monoclonal antibody raised in mouse against TDG (Thymine-DNA glycosylase), using a recombinant protein. Whole cell extracts from HeLa cells were analysed by Western blot using the Diagenode antibody against TDG(Cat. No. C15200227) diluted 1:1,000. 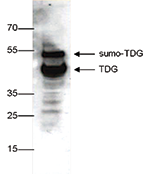 The position of the TDG and the sumoylated TDG protein is indicated on the right; the marker (in kDa) is shown on the left. HeLa cells were stained with the Diagenode antibody against TDG (Cat. No. C15200227) diluted 1:400 followed by an anti-mouse antibody conjugated to Alexa488 (left). The right figure shows staining of the nuclei with DAPI. TDG (UniProt/Swiss-Prot entry Q13569) belongs to the TDG/mug DNA glycosylase family. It removes thymine moieties from G/T mismatches by hydrolyzing the carbon-nitrogen bond between the sugar-phosphate backbone of DNA and the mispaired thymine. It is also able to remove thymine from C/T and T/T mispairings, although with lower activity. Furrther, TDG plays a key role in active DNA demethylation as it binds to 5-formylcytosine (5fC) and 5-carboxylcytosine (5caC), but not 5-hydroxymethylcytosine (5hmC), and mediates their excision through base-excision repair (BER) to install an unmethylated cytosine. Diagenode strongly recommends using this:	TDG monoclonal antibody - Classic (Diagenode Cat# C15200227 Lot# 001). Click here to copy to clipboard.